It is important to take time to love ourselves and feel good. I enjoyed reading and going through DK's Natural Beauty book written by Susan Curtis, Fran Johnson, Pat Thomas, and Justine Jenkins. The book has lots of tips and techniques that we can use, and it encourages using easy to find, gentle products such as herbs, plants, and other kitchen ingredients to care for our skin and body. Since there is a wide concern for what goes on our body, and many of us prefer using natural and wholesome foods, it is important we also think about what we apply on our body. Many studies have shown that cosmetic products containing harmful chemicals and synthetic fragrances can disrupt our hormones, nervous system and causes diseases and allergies. The book has a large section that introduces us to different ingredients we can find in our home. The book is separated into sections focusing on face, body, hair, hands and feet. I like that the book provides details and pictures to show the benefits of natural ingredients that are good for us to feel and look better. The book also mentions how important it is to have good quality sleep, be away from stress, drink lots of water, to avoid cigarettes, alcohol and skin products with chemicals. I made a paste with the ingredients and left the paste on my face for 15 minutes before washing it off with warm water and pat drying. This is a handy book to have if you are looking for a book to learn how to use natural products for your body or give to loved ones. 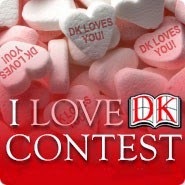 Post your I Love DK reviews on Twitter with the hashtag #ILoveDK and on DK's Facebook Page at www.facebook.com/DKCanada between January 19 and February 4th to win a $250 DK shopping spree where you will get to choose $250 worth DK books of your choice. The winner will be announced on Valentine's Day. Cool! Love that Natural Process is coming back. Thanks for a great article! Thanks for recipe will have to try it! We are big fans of DK books in our house! This looks like a beautiful book full of useful information! This face mask is a must try. Love DK books. I would love to try this face mask the next girls night. This is different, I think I should try it out! my face will love it! DK has a book for anything, love that! I just reviewed this book! I love it! Thanks for sharing! I'm extremely interested in natural and homemade products. I love the idea of using ingredients you already have around the house. Oh, this would be great for facial recipes.